We have already established that my husband loves him some hot stuff, but me and Thomas aren’t so crazy about it. That’s what makes this Buffalo Chicken Dip perfect! It isn’t too spicy, but my husband can throw some extra Tabasco Sauce on his portion and gobble it up! Plus, throw it in the Crockpot and you can take it anywhere! 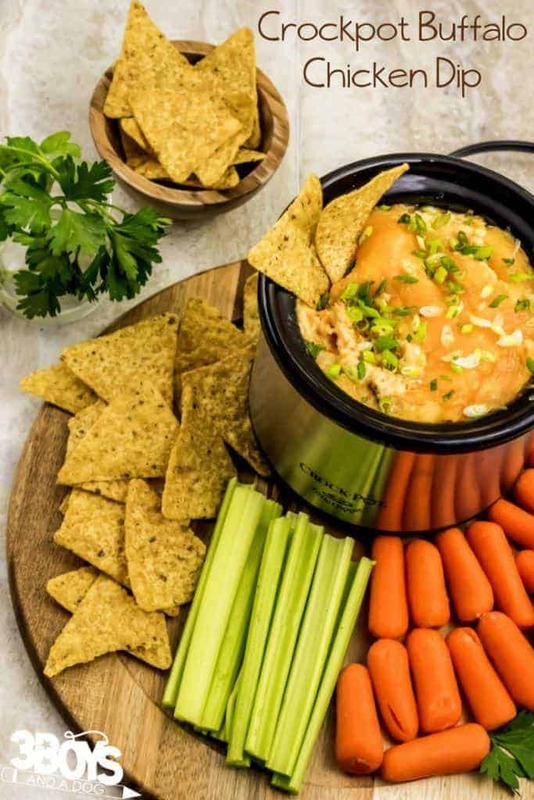 This dip recipe is a perfect appetizer for a game day party, since it takes the taste of buffalo chicken wings and makes it into a dippable spread! Add a bowl of my Hamburger Rotel Dip to create a party spread! And don’t forget to put out a bowl of my sweet Monster Cookie Dough Dip for dessert! 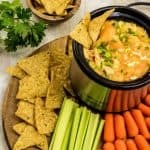 For more yummy dips, check out my list of over 30 dip recipes that only need three ingredients! This is a very versatile dip recipe, because it can be cooked either on the stovetop or in a slow cooker. To cook it on the stovetop, follow the recipe instructions below. If you’d rather cook it in a crockpot, just spray the inside of the slow cooker with nonstick cooking spray. Then combine all the ingredients in the cooker and mix well. Turn the crockpot on to low heat and cook until bubbly, 1 to 2 hours. You can serve this dip directly from the slow cooker, if you’d like. Or you can dish it into a pretty serving dish surrounded by chips and crackers. Either way works! The ranch really cools down part of the Tabasco heat! This dip would be delicious with celery sticks, of course. But you can also pair it with sturdy crackers, such as Triscuits, or tortilla chips! If you want to take this dip to the next level, squeeze a little ranch or blue cheese dressing on top! 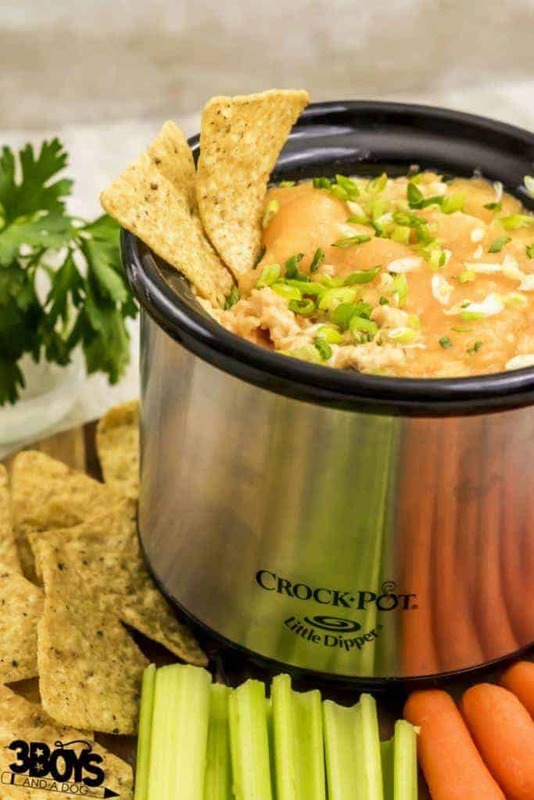 These affiliate resources from Amazon make preparing this Crockpot Buffalo Chicken Dip a snap! OMG! This looks really good. I am definitely craving for one. Will make this later tonight. Going out earlier to make sure I get to purchase the ingredients. I am so excited. Thank you! This sounds really good! We are not fans of really hot stuff, either, so I look forward to trying this out on my family! u ave to make a concise of hat actually you need from an internet marketing firm. Did you know you may not be getting the same value worldwide because SEO often varies in cost. engine tactics were being employed. ” Exactly how both of these function is explained here. This yellow metal is one way for you to not only be secured with your needs but also have comfortable retirement days. The coronet she is wearing is inscribed with the word “Liberty. What did your kids think of this when they were young? Too spicy, or no? I think this dip would be sensational at any timime but I will be keeping it in mind for when I have guests over.Thanks. I love this dip! Great for parties! This sounds like a perfect dip for when my college age son brings his friends over to see a game. Thanks for sharing. This sounds like an awesome ~ fantastic ~ recipe! I have printed it out and cannot wait to make it! Now that’s what I’m talking about. My husband is a big fan of this. His friend brought it to our summer party and he never got the recipe. It was a big hit for a lot of people. have to try this one. This looks really good, I’m not too much on spicy so glad you said it wasn’t too spicy. Think I’ll try this. I love making things in the crockpot. This looks fabulous! I hope you don’t mind that I’ve added you to my food finds blog list. It’s a work in progress, but you’re site is great! Looking forward to following. Have a lovely week!